On October 11th the Michigan Floral Foundation (MFF) honored Mrs. Bobbi Ecker-Blatchford AAF, AIFD, PFCI with induction into its Hall of Fame. This special event was held at the Amway Grand Plaza Hotel located at 187 Monroe NW Grand Rapids, MI 49503-2666. Bobbi Ecker Blatchford’s lifelong fascination with the floral industry has resulted in the evolution of a 60 year long career in that industry. Beginning with employment and then ownership of an established family floral and greenhouse operation in Iowa, Bobbi was influenced and inspired by the individuals and product that surrounded her. After relocating to Chicago, Illinois she began The Flora Pros. As a recognized marketing expert with the understanding of all aspects of the process, she is known for generating new revenue streams through imaginative marketing and cutting edge ideas. Bobbi is a noted speak er, commentator, award winning floral designer and sought after consultant to manufacturers, growers and distributors in the U.S., Canada and South America. 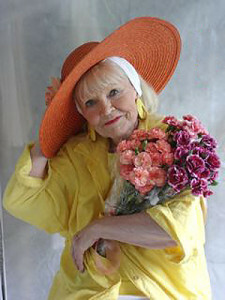 Now in her senior years, she continues to bloom where she is planted in a century old cottage and studio in Michigan. Her personal motto is – Be the best that you can be, because that always works.